When buying silver online, there are quite a few payment methods available to the investor or collector. None is prefect and each has its pros and cons that can make it tricky to decide which the best option is for a particular individual. In this article we will go over the different payment methods commonly available and highlight their advantages and disadvantages in order to help you choose one that best suits your situation. While paying for silver with a credit card is second nature for most people these days, when using one to pay for silver and other precious metals, the buyer should proceed with caution. Due to the processing fees that merchants are charged for accepting a credit card payment, and the small profit margins available on silver sales, there is a good chance that as a buyer will be charged for using a credit card. While these fees may equate to a small charge per item, the total can soon mount up when buying large amounts of silver or completing multiple item transactions. Due to the costs associated with accepting credit cards, you might find that they are not accepted as widely as they are at other retailers. For this reason it is good to have a backup payment method available to you when shopping as you may not be able to use your credit card as widely as you might assume. While this form of payment might seem antiquated, especially in the world of high speed internet transactions, when it comes to buying gold and silver it is still a popular choice. As there are no processing fees charged for accepting paper checks, many silver dealers encourage the use of this form of payment by offering a discount, or at the least, not applying the same charges they do for credit card transaction. The major downside to buying silver with a paper check is that the check has to physical reach the dealer, and then the funds have to clear before the goods can be shipped out. This whole process can take over a week, or even two weeks in some cases. As buying silver is a time sensitive purchase, these kinds of delays can see the price per unit fluctuate and could cause the buyer to miss out on a great deal when the price was low. While paper checks are perhaps the slowest form of payment, bank wire transfers are one of the quickest ways to pay for silver. Funds are electronically transferred from one bank account to another, although third party services such as Western Union can be used if preferred. The processing times for these transactions are relatively fast and most precious metal dealers are happy to accept them. This is mainly because they are one of the most secure forms of payment, reducing the risk of fraudulent payments being made. Also, as bank wires don’t incur as high processing fees, and due to their relatively secure nature, some online silver dealers will offer a discount to payments made in this way. While PayPal is increasing in popularity in many online retail sectors, precious metals isn’t necessarily one of them. If you prefer to pay using this method then you might have to shop around to find a dealer that accepts PayPal. One of the reasons why silver dealers are sometimes reluctant to accept PayPal payments is due to the fact that it can be quite easy for buyers to act fraudulently when sending money this way. As PayPal often sides with the buyer, there have been instances where a buyer has disputed the transaction, claiming the goods didn’t arrive, and PayPal refunded the money directly from the dealers account. The fraudulent buyer would then be in possession of both the goods and the money they initially sent. While this is mainly a downside of PayPal that affects the dealers, due to this problem, dealers often charge a fee for accepting PayPal. This fee increases the total price of the order, making this method of payment less attractive to buyers. 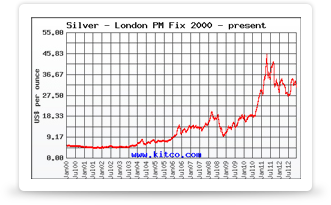 One positive PayPal does have on its side, is that the payments are usually quick to be received, reducing the chances of any fluctuations in the price of silver to effect on the amount of silver in an order. As you can see, each payment method has its own pros and cons, and therefore it is up to you to decide which one is best suited to your needs. Hopefully this guide will give you some things to think about when making a decision.